Protect your asphalt surfaces and limit the amount of times you need to repave with EverLine’s asphalt sealing and crack filling services. We can help you save money in the long term by protecting your asphalt surfaces today. At EverLine Coatings and Services we provide asphalt sealing services that will seal cracks on your asphalt surface. This will prevent water from seeping into your asphalt surface which causes even more cracking and potholes. We seal your asphalt surface by spraying an asphalt based waterproofing material over the surface. Our asphalt crack filling services is the process of filling in cracks in your asphalt surface to prevent further water deterioration. Often when asphalt crack are untreated they will develop into potholes, in fact 75% of untreated pavement cracks become potholes. Maintenance allows for the subgrade base to be protected and remain stable which will further the life of your pavement. Committing to yearly crack filling maintenance cycles is the best way to protect the investment you have made in your pavement surface. What makes EverLine the best choice among our competitors is our unwavering commitment to delivering high quality services. This is evident in the fact that we do not thin our products, we apply our sealcoating and crack filling products according to manufacturer recommendations, this ensures longevity. The preparation steps we take prior to treating your asphalt or pavement surface also is what makes us stand out. At EverLine we ensure that all cracks are cleared and sealed properly and that the ground is free of dirt and debris before sealcoating. This results in a much more effective and durable sealcoating application. In order to ensure the we are maximizing the durability and value of your sealcoating services we always apply to coats of sealcoating. We want to ensure our protection services will last far past those of anyone else. We also only carry products that are built to take on tough Canadian winters. At EverLine Coatings and Services our years of experience and rigorous training has made us asphalt sealcoating and crack filling experts. Our asphalt sealing crews have worked on all types of properties in various locations, they have seen it all and done it all. At EverLine we also adhere to a continued training program for our asphalt sealcoating and crack filling crews. We are always innovating and finding better and more efficient ways to provide our services. This means we are dedicated to keeping our crews on the cutting edge of asphalt sealcoating and crack filling processes and products. Our sealcoating and crack filling services have many benefits including slowing pavement deterioration considerably, adding traction and improving ride quality. Our services also help your surface looks like new, minimizes the effect on the environment in the long run and saves your business money. 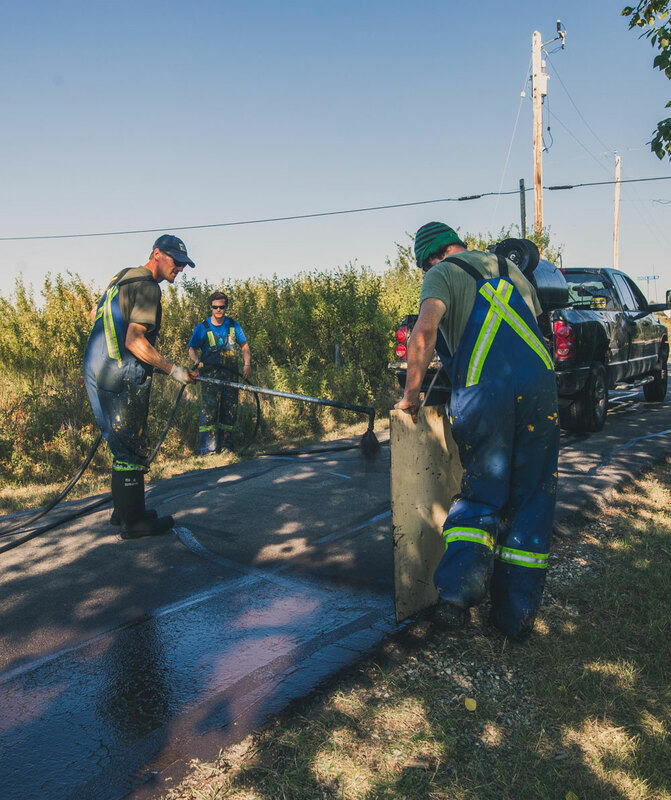 There are steps you can take prior to the arrival of our asphalt sealing and crack filling crews to ensure they can deliver effective and efficient services. Preparing your asphalt surface properly will ensure that we can deliver our services within a predetermined timeline. Depending on the volume, difficulty, traffic and materials being used on site our prices can fluctuate. This is why we do not offer flat pricing and all of our pricing is done on a per job basis. At EverLine we strive to deliver the best possible value for our clients and this is why we need all of your project details before providing a quote. We have experience working within a wide variety of budgets and know how to work with clients to deliver appropriate services within a set budget. To receive a quote on you upcoming asphalt sealing or crack filling project please contact us.